Here are a few more images from John Carter of Mars. These are a couple of designs for the "enemy" city of Zodanga. It's supposed to be a very militarized industrial city. My thought for the design was that they would have built within a pair of overlapping meteor craters. Barsoom (Mars) in the stories is metal-poor, so my hypothesis was that the main source of mined metals would be nickel-iron meteors. Zodanga then is built within a deep mine at the center of the craters, while the debris walls would form an effective natural battlement. John, Deja and company escape from the Warhoons on their Thoats, with Woola guarding the flank. 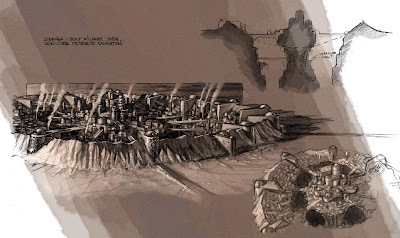 The ruined city of Thark. I loved the idea of erosion happening from below, rather than above, and I played with it throughout the various cities. Buildings would be glassy fused sand, so the thought of a kind of coastal erosion look from the eventual decay of the bonding agent and the constant sandstorms seemed natural. I also love the gravity-defying quality, since Mars' low gravity is such a major plot point in the story. The City of Helium. I wanted a much softer look for this city, and more modern. To keep a consistent look though, I thought that it would be cool to have the Barsoomian architects adopt the look of erosion from their ancient cities as a deliberate design statement. I thought it could be like the way we artificially age materials, or grow ivy on walls, something that lends an artificial air of authenticity to relatively new architecture. I also played with the idea of flared bases that were then undercut to emphasise the gravity-defying quality of Barsoomian architecture. Jon Favreau also wanted to hint at an allusion to the Twin Towers in the twin towers of Helium, so topped them off with a bit of the WTC fluting. First, let me start off by saying that I've only listened to a fourth of an Audio book version of John Carter. I had to stop because I just didn't like it. I don't like red desert imagery that I get from the book, which is weird because I love Frank Herbert's Dune (both the books and the films). With that said I love this concept art work. You've done an awesome job of capturing epic vistas and architecture. You've actually got me excited for the Andrew Stanton film. I suspect that you use scanned in line art and then paint onto that and if so it looks great. You've certainly got a unique style and I look forward to seeing more. Thanks for more great John Carter stuff. Jon was telling ( or hinting to ) a whole herd of us on his 'John Carter MySpace site' about some of this stuff. He wanted to show us but couldn't at the time. Thanks thanks thanks. Hi Matthew, glad you like the pics. Actually, all of these were painted directly in Photoshop. I tend to thumbnail my compositions in pencil, but then try to recreate them in photoshop to keep the freshness (besides, tight drawings take too long.) Line art is fine for detailed technical stuff, but for the most part landscapes you want to block in in color masses, then sneak up on the details. With line art you tend to get too caught up in the lines and details, and it becomes tough to break free. Venusian, happy to oblige. I hope the new version comes out well, there will be a lot of continuity with the two previous attempts, as my friends Ian McCaig and Ryan Church are working on this one as well. Awesome! I wish the whole teams work could be released somewhere. Thanks for posting these Phil. What can I say but truly brilliant artwork? My compliments! The quality and sheer vision of your art reminds me of Jodorowski's superior Dune film project, with Chris Foss, Moebius and H.R. Giger as artists. How I wish that film would be made with the latest technique's and budget as 'Avatar'and a film on the Barsoom series based on your art with an Avatar-budget to match! As these things will never materialise, we need to patiently wait until there is powerful software around capable of doing this kind of thing. We already see the rudiments of this technology such as in the 1990's Machinima projects, the various MODs and TC projects and that Youtube robot film hit. But imagine this: A trilogy consisting of Dune, Barsoom and Trantor. These are simply stunning realizations and do much to assuage my fears of the forthcoming films being rendered without heart, style or feel for the source material that is so precious to so many of us. Your work is just incredible - I especially love how you've designed Woola and the Thoats. I think Frazetta has always dominated Barsoomian artwork because he captures the spirit so well, even if his technical details never quite match the books descriptions. What you've done here is to get both the spirit and the details right. Bravo. I noticed reference to Favreau. Are these realizations for what he would have done, or for what Stanton is currently doing? I sure hope it's the latter. I have had a few authors and illustrators tell me it's a good meditative aural background for the creative process. I'd be thrilled if it was a part of yours in your Barsoomian endeavours someday. Ah, what would we do without vistas to look at all day long, ’ey? Probably just be reduced to looking at details, just to pass the time.